Great all round tyre for the road and off road. My last set of tyres for my vehicle were the BF Goodrich All Terrain KOs and they served me well. So It was an easy decision to go with the new BF Goodrich All Terrain KO2s. Stylish, reliable and most of all great off road. If your in the market for an all terrain tyre you can't go past the BF Goodrich. Thanks to tyresales.com I also got the best deal. Am very happy with the tyres. They arrived early and look awesome! Very happy with the All-Terrain tyres. Great price and friendly fitting service. Great service ..ordered from interstate and they were delivered on time and in full. Graham Crooks Tyre guys were excellent. I found that tyresales are great people to deal with and will be using them again. Great tyre for on road and off. Just towed a caravan from Canberra to Mackay and back, including time in the sand of Fraser Island. Tyres were awesome, could not fault them. Nice and quiet and handled tough hill climbs well. Only 5000 kilometers thus far so will see regards tyre life. Best tyre I have ever driven on. Puncture resistence is insane and it didnt show any signs that the bead wanted to roll off even on low 10psi. Grips very well on every surface and quiet on the road like a highway tyre. Will definitely be getting another set! Recommend to anyone. I love these tyres! I live in the high country and they're perfect in the snow and on the icy and muddy roads. They look great, I've had a lot of comments and questions about them too. The only thing that's a bit annoying is the added road noise but that was going to happen no matter what all terrain tyre I brought. I have them fitted to a Mazda CX-5 AWD. The product is excellent, the service was quick and easy. Great all round grip and low road noise. Excellent tyres. Highly recommend them. The K02's are simply the best all terrains on the market. They last forever and are real grippy on and off road, they look great too. Real aggressive side walls just set them off. Highly recommended. Much better grip and less noise than my previous Bridgestone A/T tyres. Service excellent with fast delivery. Very happy. The purchasing process was very easy and tge people we spoke with were very helpful. The tyres were fitted at my home by a mobile fitter which was so convenient. Tyres are great very quiet on the road and made a big difference to the comfort of the Lexus 470. Will recommend and use this supplier again. Easy and? efficient service . Great service and an excellent price. Very happy. First time I've had BFGs on a car, usually Coopers or Michellin. still like Cooper but decided to try BFGs, only done small mileage so far but very quiet on the road, time will tell when we get more offroad. Fantastic product. Felt an enormous difference the minute I drove out of the service centre. Would highly reccomend them to anyone looking for a quality tyre. Fantastic tyres,good longevity and great off-road and on road performance,not noticeably noisey. Only drawback is the price, but you do get what you pay for. I was rather hesitant about buying tyres on-line but eventually threw the cash down on a set of BFG’s, the price I got online couldn’t be beaten after numerous attempts to source locally. The delivery to the local tyre shop and installation was on time and painless (surprising). It was quite ironic at the same time a large tyre retailer had an ARB promotion (air compressor) as part of a package deal on the same tyre. Even taking this into account the money saved I could have bought the compressor new from ARB and still had change, better in my pocket! These are a great tyre i couldn't beat the price. excellent service all round by tyresales team thanks. I have used KO's previously and did not hesitate to buy KO2's when i needed new tyres and have found them to be as good as i thought they would be. Perfect, easy straight forward transaction, we had then within the week. These BF Goodrich tyres are very quiet on the road and stable on the dirt. This is my third set of BF Goodrich tyres. Turn well and long wearing but rattles in vehicle due to vibration. Absolutely brilliant tyres and a great price on tyresales.com. Wouldn't buy any other tyres. I would say one of the best tyres i've brought the k's you get out of these tyres are upwards of 80,000 ks my last set had 82,000 and still had 30% left on it before i got new ones. a great on road and offroad are great i've never said to myself "hmm i need more traction on this hill" as this tyre just grips and goes never had a puncture just the best tyres i've owned! BFGOODRICH All Tertain T/A KO2 are the best 4WD tyres to suit the conditions I drive - country roads, bitumen, gravel and bush tracks. The tyres were delivered to a reputable outlet within 3 days of purchase from Tyresales. Excellent service. Excellent tyres, great grip and look the goods. A great all round tyre. very little road noise,great on the beach and gravel. Excellent traction on wet roads. By far the best tyres I have ever purchased. Very happy with the new tires and got them at a very good price. Have always used the opposition to these tyres and and little trouble at all but these tyres were above and beyond my expectations, wear evenly and very low if any road noise compared to others. Recommend highly to any one looking for a quality tyre at a reasonable price. Just completed the gibb river road On my new K02's handled everything with ease, including the trip to the Mitchell falls in the early dry season, we even pulled out 2 cars on Coopers! These are fantastic tyres for both off and on the road, being a very big tread all terain tyre they are surpisingly quiet on the road. A mate of mine got nearly 100,000 klm from his set which was the big selling point for me to purchase these. Also dealing with Tyre Sales was a really easy process from start to finish and I have highly recommended them to all my friends. Great tyre, done around 7500k so far and wearing really well, low noise on high at 100km/h, will definitely purchase 4 more we needed. As the tyres have only covered about 5000ks since fitted it is rather early to be commenting. However, I do believe they are quieter than the previous design and whilst we haven't done much off-roading with them they seem to work well on the dirt. We tow a 3.5 tonne caravan and so it is important that we have confidence in our tyres. Ask me again at 60,000ks! Great tyres! Quiet on the highway and useful off road. Very happy with these tyres. Towing a heavy caravan and still getting good wear compared to others I have tried. They perform well on dirt roads (no caravan) as well as plenty of grip on wet roads. Travelling around Australia in our 4wd and caravan in all sorts of weather and they have not looked like letting me down. Great tyres! Heaps of tread! Quiet on the road, but can handle the mud & rocks. I have upgraded from stock tyres on a 2016 Ford Ranger which only got me 28,000kms on the country roads I live on. So far I have put about 10,000kms on these new BF's and am quite happy with how they are performing. Rubber is a bit soft compared to a similar Mickey T and have lost their sharp/square edge, but have not yet worn down the first tread wear indicators. These tyres have so far put up with some pretty harsh driving conditions living in the snowy mountains, and are relatively quiet for highway driving. I have been running them at relatively low pressure and that seems to be how they ride best all round. These are definitely not suited to mud terrain, but do quite well off road in adverse conditions. Would advise that like most A/T tyres on a ute with no load in the back, can get a bit skiddy in the wet on bitumen. Overall a very good, comfortable tyre so far and hope that they get me 60,000+ kms. 20K km in and they still look brand new. Covered all terrain, mud, rock, sand, bitumen, lots of grip, very happy, great value! Great tyres. Very little road noise. Got great mileage from the last set. Would highly recommend them to anyone. This is the 2nd set of BF Goodrich All -terrains that we have had, one set on the Prado and this set on an Amarok. They are fantastic tyres off road and on the highway. On the Prado we have done about 90,000km and reckon there's still another 5-10,000 in them (we said that 5-10,000km ago!) We will get another set for the Prado when the time and $ is right! Great tyres on road and off. Would buy again. Only done 13000kms and they are worn down, well need to be replacing within the next 2000kms. 15000kms out of a set of 4 new tyres is not acceptable. The first set of BF Goodrich A/T K02 we brought lasted over 50000kms. The next set purchased in January have not lasted. The reason we went for the some tyre again was because the first lot lasted. We aren't doing anything different at all. We do do a lot of kms due to the fact we have out of town Australia Post Contracts. Last week we had to replace the set we brought in August last year but this time we replaced them with BF Goodrich T/A K0 to see if they last longer than K02. We will be making contact with BF Goodrich about the the wearing of the tyres. I have driven these tyres on steep rough terrain tracks in the Snowy Mountains, on winding coastal roads both in the wet and dry and on 110 kilometre per hour freeways. I have found these all terrain tyres to be brilliant value for money, all terrain tyre. I am already recommending them to friends. Best tires I've ever driven on. Amazing feel on the road, mud, dirt, sand and snow. Rain hail or shine. The tyres are fine, actually fantastic. Got them fitted through tyre sales who sent me to the local Ford dealership. I get at least two texts/calls a month from wignal Ford telling me a random car (not mine) is booked in for a service. Pain in the A. All because I got tyres fitted through a recommended tyre sales shop. Good tyres, good service but now ive got regualar nucence calls and texts. Have used these tyres for the last 20 years exclusively. Unbeatable all terrains. Good tyre for combination on and off road. Excellent grip on a wide variety of surfaces including gravel, rock, hard pack clay and sand. Outstanding on- road manners and very quiet! Best all terrain tyre I've ever owned by far! This was a hassle free, easy transaction that went like clockwork. Great prices, great service and couldn't be happier with the price. Excellent tyres as usual from BF Goodrich - fitted on time. So far the product is performing beautifully in all kinds of conditions and are extremely quiet on tar, easy people to sort out any situation that may happen before they are fitted, and full of information and happy to help ?? Really aggressive looking AT's that look mint on your car without sacrificing the negatives of having actually muddies. Side wall tred really improves there capabilities off road and massively improves beach driving! As expected they don't handle as well as the road tyres i had but are pretty quiet for all terains. Already had to flick a half a dozen bits of gravel out of the tread that jammed themselves in pretty good. Something to consider if spending a lot of time on gravely roads. Too early to comment on longgevity or traction in the rough stuff. Although the pattern loogs the goods for traction. Theses tyres have to be one of the best tyre i have driven on when it comes to road noise, off road grip. Having just completed a trip away, these tyre performed excellent at pressures lower than 20PSI making offroad in the sand a breeze. I would recommend then to any body. Great Tyres whether on or off road, went for a higher quality tyre this time and they didn't dissapoint. Looking around I've noticed just how popular they are and I can see why. So far I'm very pleased. Although I have seen some BF Goodrich deteriorate after only a few thousand kilometres. My last set were fine so hopefully these ones wil be too. I had the BFG KO (series one) on prior to fitting the new KO2's. The KO is a brilliant tyre and I didn't really think there would be much of a difference between the old and new profile tyres. Boy, how wrong was I? I tried the new tyres out on the beach recently and found they had a lot more traction than the previous KO tyres. Where other vehicles were finding hard going in some soft sections of the beach the new KO2's didn't have a problem, they went through the softer boggy bits with ease. Even from a standing start in soft sand, they gripped up straight away! I really love these tyres, they are the best. Whole thing went smoothly looking forward to getting off road Changed from a factory fitted tyre and expected some road noise but hardly any difference!! Great service and great tyres and great service from Tanilba Bay Auto who really looked after my needs! Thank you. Low noise and good griping tyre was what I was after and that's what I got. And a good looking, comfortable one at that. KO2 Is a perfect all rounder. I'm very happy with my purchase at only $324 a piece through tyre sales. (My local bloke wanted $475 each.) The only down point was that it has only 2 steel belts. I have been using bf goodrich tyres for 30 years and every set has lasted for over 110 000km. Great for the bush and the sand as an allrounder. Absolutety an awsome tyre... would recommend to new buyer. These KO'2 i have on my truck now... leave the Mickey Thompsons i had on previously. FOR DEAD !!! Loving these new tyres. Quieter than anticipated on road and meet my needs for a slightly more aggressive AT without the extreme of an MT tyre. Thanks tyresales.com for a seamless purchase and fitting with a local dealer. Great tyres - already used them out on some very flooded tracks, grip is excellent. Road noise is minimal as well. Very happy. Great tyres so far, less road noise than I expected. Good on dirt roads, feel confident with them. I'm very happy with my BFG KO2 tyres. Excellent grip over a variety of surfaces and give confidence in off road situations and when towing. I only criticism is they are a little harsh around town. Given their LT strong construction that probably should be expected. This is more that off set by the positives and I'd definitely recommend them for anyone looking for a 4x4 tyre. Oh and they look great too! Good tyres, terrible service by their agents. Tropical auto group Rockhampton. I paid for a wheel alignment and chose tropical to fit my tyres because they advertised a complimently car wash as well. Vehicle was delivered at 9am and i was still waiting at 4:30pm. Wheel alignment wasn't done and didn't get washed. I watched it come off the hoist! I won't buy tyres from tyre sales.com.au again if they endorse poor agents to complete the transaction. Scrub TAG Rockhampton off your list! First off - brilliant service from Tyresales. Fantastic delivery to Adelaide, brilliant communications all the way. Extremely happy with the overall service. Tyres themselves are brilliant. Had them fitted then promptly set off for Coober Pedy, Oonadatta, Lake Eyre, Flinders Ranges. Didn't miss a beat in the dirt roads. Very comfortable and quiet tyre on bitumen. After 55K of the original road tyres I was a bit concerned that moving to all-terrain tyres (my first 4WD) might be a bit lumpy and noisy on bitumen. Nothing of the sort. Nice and quiet, much better in the wet than another well known brand, good steering, still working out ideal pressures and still to take off road but they have a good looking strong sidewall. Let me start by saying Tyresales were perfect. Easy to deal with, great communication, and I saved about $200 on 4 tyres. However my debacle was with the fitter I chose, they didn't do my wheel alignment properly and the car still pulled badly to the left. After taking it back twice, they still couldn't fix it, so I had to take it somewhere else which really chewed into the $200 bucks I saved. In fact, between paying for the alignment that they couldn't do properly and then having it done by someone else, to fix it, the $200 was gone. The fitter also damaged one of my rims in the fitting process. After a week of assing about they decided they couldn't find a matching rim and after my insistence, they had to replace all 4 rims as well. Tyresales, absolutely no problems, I would absolutely recommend this company without hesitation. However CHOOSE YOUR FITTER CAREFULLY !!! The BF Goodrich All Terrain KO2 are great tyres, not noisy, look fantastic, and excellent on and off the road. Highly recommended them. only been on the car for 2000 km and already need a rebalance. Interested to see how many kms I gets. So far the tyres have been very good, much more quite than our previous brand tyre, a smoother ride & better handling. Absolutely great off road and the improved side wall tread is awesome. only 3000km on them so far, so cant comment on longevity yet. Excellent service at a great price. Tyre sales staff went that extra mile to solve a delivery issue. Extremely satisfied. These are definitely the best all terrain tyre I have used. Very quiet on bitumen (when new), excellent dry and wet bitumen traction for around town and out on the highway (important for an unloaded ute). But these really shine on dirt and off road where traction on the mixture of clay and sharp rocks where I live are just excellent. I really have to drive in a ridiculous way to get them to break traction. They stick like glue even up the steepest climbs in the wet. 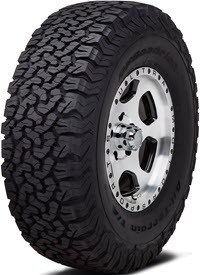 I have had good experiences with Pirelli and Bridgestone ATs and in fact liked them more than the old BFG KO but I would rate these KO2's even better. Highly recommended. This was the best internet transaction I have ever undertaken, the services was exceptional & I saved over $300.00 on my purchase. I highly recommend this service. Minimal road noise. Great traction. Look good. Fuel efficiency did drop slightly though. Delivery and fitment was fast and easy. Haven't been happier with any other brand of tyre. The service I receiced was amazing. Fast, efficient and exactly what I ordered. Blood Toyota in Geelong provided a very high level of service. I would recommend this process to anyone looking for the same! My all terrain had previous were great these all terrain ko2s are even better more ruggered appearance and comfy to drive on dirt or road ?? 4 out of 5 tyres were great. The 5th tyre developed a bump in the sidewall, that subsequently burst on some rough ground. There were no marks on the exterior of the tyre, so I think the was a problem on the inside side wall. The other 4 tyres did 34000k and look almost new. If that one tyre had not failed, I would have been delighted. Have done about 12k on my KO2's since January and they have hardly worn at all. So far they have yet to let me down and have coped well with surprising amounts of mud this winter. I have enjoyed 20k on these tyres and could not be happier to date. They are excellent on road and have performed excellent off road. This is the perfect tyre that meets all the expectations and is tough as nails. The process of purcahsing these tyres online via Tyresales.com.au was excellenet and painless. You get the best price, order them and get them fitted. No hassles. Will be doing all my future tyre purchases this way. Used BFGoodrich tyres for the past 20years and never had any issues or flats. Thicker sidewall and generally heavier tread than the earlier model All-Terrains I've been using for years, which is all good. The only complaint is that these are missing the small lip of rubber that protects your rims like the older ones have, but otherwise they are a great general purpose 4WD tyre. Great product, Great delivery time and installed perfectly Guys at the tyre fitters were great. Great tyres! Much quieter and smoother on the road than my old Mud Terrains. These tyres have terrific wet weather grip and awesome dry weather handling. A great all rounder, very happy. Fantastic Tyre. Next to no road noise! Great off road. We were very happy with our previous All-Terrain 60,000 km off road and on the black. The new KO2 look even better. These are great tyres and Tyresales were so good to deal with! The purchase of new tyres through Tyresales was an smooth experience at all levels in the process. The personal follow up service to confirm the order was exceptional. Awesome tyres! Can’t fault them at all. Great looking tyre and will do great off road. When I purchased my KO2 BF GOODRICH the guys at tyre sales were awesome to the end sorted any issues drama which i may had down to changing mud tyres to ATs and place of fitment. Also getting the ute washed was a great service. Highly highly recommend these guys for there professional and quick service. Keep up the good work guys. Great tyres! Best I have tried! We bought the tyres from Tyresales who sent them to our local dealer for fitting. Everything was trouble free. We couldn't be happier with the tyres, the ride now is like riding on a cushion. Lovely. The thick tread also comes on to the wall and that will provide extra safety off road. Love them. Great set of tyres. Quiet on the highway and very capable and reliable off road. So far they are wearing fine. Great aggressive looking all terrain tyres. Surprised at how quiet they are on our hilux. We bought a 2006 Prado six months ago to travel Australia full time and when the tyres needed replacing early in the new year we knew, based on feedback from other travellers, which tyres we wanted to buy. With 5 new tyres to buy, we were pretty happy to find tyresales (great price) and organise delivery and fitment at the next stop on our travels. So far we are very happy with our BFGs... great grip to handle learner drivers going to fast around the roundabout, nice and quiet in the wet (while the previous Coopers were noisy) and while we haven't taken them on any serious 4WDing yet, we expect they will cope well. Looking forward to a long run with these tyres and putting them to the test. Replaced Pirelli scorpions, bfgs are a little louder and throw a lot more stones when on dirt. If I was only doing black top scorpions are are my pick. While I am doing a lot more off road the bfgs are ideal as I do not want muds. Larger diameter has cost a little power at wheels but happy with height. Hi bought 5 of these tyres and so far they have been awesome. Great wet and dry handling with little to no road noise and great on the beach. They do pick up some small stones but that is to be expected for an offroad tyre. Great allround tyre. Shaun from Newcastle. Great Tyers and quick delivery through good communication. I do feel that the wheel alignment cost should be included upfront into the total quote cost rather than as an add on. At this stage I am loving them. The ko2 look like they are going to last awhile. I also like the look of the tyres. I have been on dirt roads and bitumen and seem to be all good. Great tyres and service... I am happy to recommend Tyresales everything went to plan. Great tyres on and off road. Low noise around town and at highway speeds. Exceptional traction in sand and in low range walking through difficult obstacles at low pressures (14psi). Haven't tried in mud yet but so far I cannot be happier. So far so good , must say they are a very Quite tyre on the tar compared to the old style I had on my GQ . I am very happy with them so much so I bought another set for the work ute and would honestly recommend them to anyone looking for a tough off road tyre. The process was simple and no hassle. Combining toughness, durability and traction, this All-Terrain 4WD tyre will give you the confidence to take on the harshest challenges. The BFGoodrich T/A KO2 is the toughest All-Terrain tyre ever and provides enhanced grip in mud, snow and rocky conditions thanks to the ‘Side-Biter’ lugs and ‘Mud-Buster’ bars. And, with a serrated shoulder design, plenty of manoeuverability in soft soil and deep snow. The tough sidewalls lower the chances of cuts and tears, ensuring protection in all terrain. The advanced tread design also guarantees a longer tyre-life both on and off-road. Thank you! Your enquiry has been sent to our Tyre Experts who will contact you shortly. We encounter issue when submitting your enquiry, please try again shortly. Width - The tyre width measured in millimetres (185 in the example below). Aspect Ratio/Profile - The profile is the depth of the tyre sidewall. This measurement is taken from the wheel to the outer circumference of the tyre and is a percentage of your tyre's width. So in this example the profile is 55% of 185mm. Rim Diameter - The diameter of the wheel rim measured in inches. The example tyre below is 15 inches. Tyre speed rating and load index - The tyre's load index and speed rating tells you the maximum load capacity and speed that the tyre can be safely operated. Some Commercial, or Light Truck vehicles require Commercial-rated tyres. These tyres will display a "C" after the rim size on the sidewall of your current tyres - e.g. 195R14C. If you require Commercial-rated tyres, please call our Tyre experts on 1300 897 372 and they will help you source the correct tyres for your vehicle. Where would you like your tyres fitted?